Tallinn, Estonia's capital, still has the charm of a medieval city. Located in the Gulf of Finland, the city is dominated by Toompea hill, the upper town, the first historic core of the city. The oldest part is in the south of the Bay of Tallinn, and includes the upper city, Toompea, and the lower city, at the foot of the hill. Over 2.5 miles of walls surround the medieval upper town, in whose center is the large Raekoja Plats, the town square. The most modern areas are those around Vabaduse valjhak. From a tourist point of view, worth a mention the old pharmacy on Raekoja Plats, a little further north the Palace of the Corporations (Eesti Ajaloomuuseum Suurgildi-hoon,) archive of Estonian History Museum, the Toompeae Castle, Hermann Tower, the Alexander Nevsky cathedral, and out of the old town, the imperial palace of Kadriorg. Tallinn is a very green city with parks and gardens. At the bottom of a narrow street, Saia kaiki, is the Puhavaimu Kirik, Gothic church of the fourteenth century, with the oldest clock in Tallinn, dating back to the end of 1600. At 17 Puhavaimu tanav street there is, instead, the museum Linnamuuseum with the history of the city from its origins to nowadays. The Garden of the Danish kings is famous for the musical and artistic events that it hostes during the summer. You can access the lower city through the door towards the Coast: the port of Tallinn is very nice to visit, with the medieval houses of the merchants of the Hanseatic League that overlook the docks. In Tallinn, there are several hotels available to tourists, all generally concentrated in the centre. Many are housed in old buildings that do not have access to all the amenities you are accustomed to in other European capitals. On the other hand, however, the price for the rooms is quite affordable. The streets of fun in Tallinn are both in the old town and along the harbor, such as Suur-Karja, Vene Tanav, Rataskaeuvu tanav, Mere puiestee or Vineeri tanav. 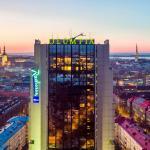 The Radisson Blu Hotel Olümpia is a true symbol of Tallinn, capital of Estonia. From here you can admire panoramic views of the old city and the Gulf of Finland. The hotel has an environmental certification mark.